ITIL® 4 Foundation is the most widely acknowledged entry-level ITIL certification available for IT professionals. This newest training for the ITIL framework is designed to introduce learners to the management of modern IT-enabled services, including key concepts and common language used in the ITIL services lifecycle, how lifecycle stages are linked, processes involved, and best practices for improving the quality of IT services across the IT organization. What are the career benefits of this ITIL® 4 Certification? ITIL® 4 is the latest release of the ITIL framework, designed to provide a more practical viewpoint to the ITIL lifecycle with best practices from other complementary platforms such as Agile, DevOps and Lean. The objective of this course is to provide a foundational level of understanding of the ITIL 4 framework, key elements, concepts and terminologies associated with ITIL service lifecycle, and how it has evolved to adopt modern technologies and operational processes. The course covers all necessary concepts in the service management framework to support candidates studying for the ITIL 4 Foundation Certification Exam. Concepts, key principles and process models required to pass the ITIL 4 Foundation exam. How ITIL principles can help an individual understand and apply IT service management in their organization. How to improve customer experience and ITSM efficiency with the help of ITIL tools and techniques. The purposes and key terms of 15 ITIL practices. Industry best practices for deploying IT services. What is the format for the ITIL Certification Exam? What is the ITIL® 4 Foundation Certification? ITIL® 4 Foundation is the most widely acknowledged entry-level ITIL certification available for IT professionals. This newest training for the ITIL framework is designed to introduce learners to the management of modern IT-enabled services, including key concepts and common language used in the ITIL services lifecycle. How long will it take to receive my ITIL® 4 Foundation exam results? You will receive the ITIL® 4 Foundation results from 10-15 days after you take the exam. When I can register for the ITIL® 4 Foundation exam? The ITIL 4 Foundation exam can be scheduled at your convenience. Once you are ready to take the certification exam, contact the Simplilearn support team and they will provide an exam voucher code. How will I take the exam? Customers outside of India will take a web-based exam. Customers in India will take a paper-based exam. Customers are expected to book the exam before the expiration of the validity of their course. I would like to book paper-based exam in India. What is the process? Once I have booked my exam, can I get a refund? Once you have booked your exam and the voucher has been issued, it can not be refunded. Who are the trainers for live classroom training? All of our highly qualified trainers are ITIL®-certified with more than 15 years of experience in training and working in the IT domain. Is the examination fee included in the course fee? Yes. The examination fee is included in the course fee. Does my ITIL 4 Foundation certificate expire? The ITIL 4 Foundation certificate does not expire. How does the online classroom training work? Online classroom training for ITIL® is conducted via live streaming and run by an ITIL-certified trainer with more than 15 years of work and training experience. The class is attended by a global audience to enrich your learning experience. Is this live training, or will I watch pre-recorded videos? What if I miss a session? All of the classes are conducted via live online streaming. They are interactive sessions that enable you to ask questions and participate in discussions during class time. We also provide recordings of each session you attend if you miss a session or for future reference. What is the average starting salary for an ITIL® certified professional? Combining an ITIL® certification with other certifications can significantly increase your salary range. 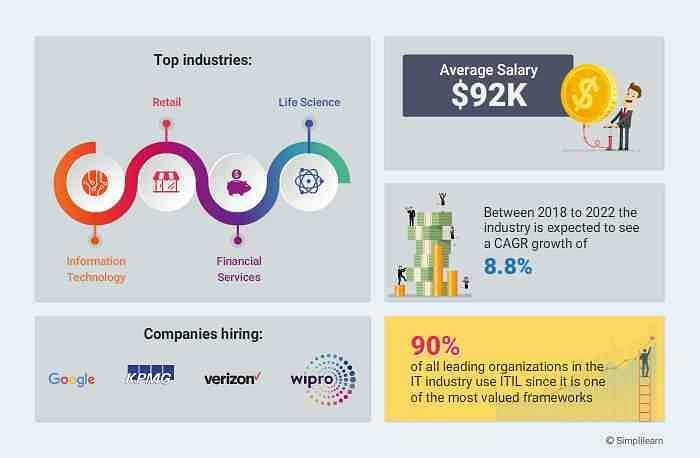 For example, a Cisco certification holder who earns about $83,000 a year can jump to more than $96,000 in salary with an ITIL certification. Headset, speakers and microphone: You’ll need headphones or speakers to hear the instruction clearly, as well as a microphone to talk to others. You can use a headset with a built-in microphone, or separate speakers and a microphone. What are the ITIL® certification levels? Managing Professional (ITIL MP) and ITIL Strategic Leader (ITIL SL) designations. Further details about how to become an ITIL Master will be released at a later time studying for the ITIL Foundation exam. What are the main differences between ITIL V3 V/s ITIL 4? ITIL® 4 should be seen as an expansion of the time-tested ITIL framework, not a replacement. ITIL 4 and ITIL v3 provide guidance based on the same underlying principles, but ITIL 4 takes a new approach to present this guidance. While ITIL 4 retains many of the core elements of ITIL v3, and much of the existing guidance will be recognizable in parts of ITIL 4, the new modules are distinct from the old ones. When will ITIL® v3 be discontinued? The transition will be a gradual process, allowing our learners to have enough time to move from ITIL® v3 to ITIL 4 and to continue collecting their ITIL v3 Intermediate credits to enable the transition to ITIL Managing Professional. Until when can I purchase the exam voucher from Simplilearn? Your exam voucher is included in the price of this course. However, you must book your exam within six months from the date you purchased this course. In case of any change of exam fees by the certification body within the six months, you will be liable to pay the difference of amount to Simplilearn. If you did not book the exam within six months from purchase, you will need to buy the voucher again as per the actual price. I have an ITIL® v3 Foundations certification. How do I update my certification to the current version? To upgrade your ITIL v3 Foundation certification to an ITIL 4 certification, you will need to take an ITIL 4 Foundation course. I have an ITIL® v3 Intermediate certification. How do I update my certification to the current version? If you have achieved three credits from ITIL® Intermediate, then you have two options to proceed. Option 2: You are encouraged to achieve 17 credits from ITIL v3 to become eligible to take the ITIL Managing professional transition module. I have an ITIL® v3 Expert certification. How do I update my certification to the current version? If you have achieved six credits or more since your v3 Foundation certification, then it is in your best interest to continue collecting v3 credits to prepare yourself for an easy transition to ITIL 4 and gain the ITIL Managing Professional designation. You will need to reach 17 credits to be eligible to take the ITIL Managing Professional transition module.